Portable, free-standing whiteboards are an essential tool in any office or classroom and when they've got a magnetic dry erase writing surface they're even better. 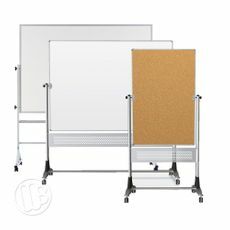 MyWhiteboards.com offers a wide selection of magnetic free standing whiteboards in different frame styles and board options. 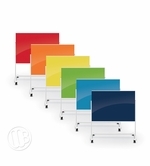 You can select from a porcelain steel, magnetic dry erase writing surface or one of the newer magnetic glass options. 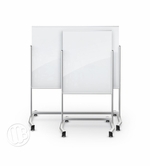 Some of the units also offer a cork tack surface on the reverse side. 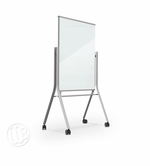 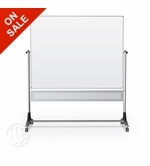 A free-standing whiteboard means that the unit stands on it's own and isn't mounted to the wall. 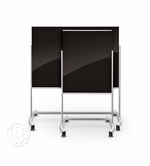 There is a wide base that keeps the board from falling over and the unit will have casters or wheels that allow you to move the whiteboard around the room or from room to room making the unit portable. 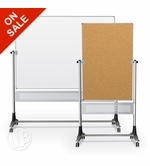 Reversible means that the board on the unit can be flipped over. 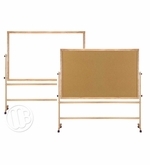 There is a pivot point in the center of the board that allows you to flip the board from one side to the other without having to turn the entire unit around on it's axis. 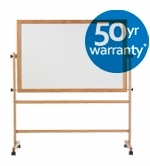 Different boards will have different ways to secure or lock the board into place so that the writing surface will not move until you want it to.